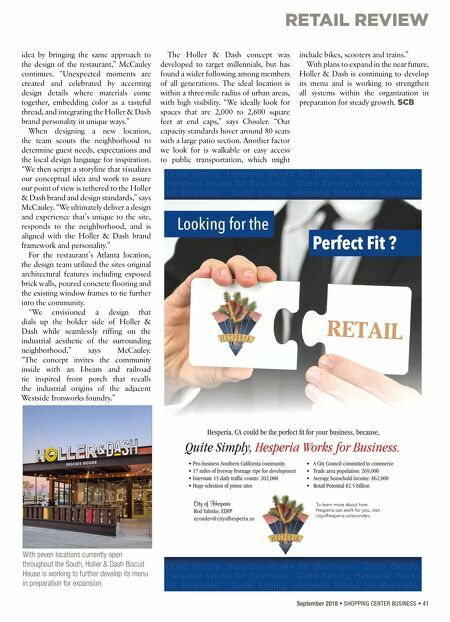 RETAIL REVIEW September 2018 • SHOPPING CENTER BUSINESS • 41 idea by bringing the same approach to the design of the restaurant," McCauley continues. "Unexpected moments are created and celebrated by accenting design details where materials come together, embedding color as a tasteful thread, and integrating the Holler & Dash brand personality in unique ways." When designing a new location, the team scouts the neighborhood to determine guest needs, expectations and the local design language for inspiration. "We then script a storyline that visualizes our conceptual idea and work to assure our point of view is tethered to the Holler & Dash brand and design standards," says McCauley. "We ultimately deliver a design and experience that's unique to the site, responds to the neighborhood, and is aligned with the Holler & Dash brand framework and personality." For the restaurant's Atlanta location, the design team utilized the sites original architectural features including exposed brick walls, poured concrete flooring and the existing window frames to tie further into the community. "We envisioned a design that dials up the bolder side of Holler & Dash while seamlessly riffing on the industrial aesthetic of the surrounding neighborhood," says McCauley. "The concept invites the community inside with an I-beam and railroad tie inspired front porch that recalls the industrial origins of the adjacent Westside Ironworks foundry." The Holler & Dash concept was developed to target millennials, but has found a wider following among members of all generations. The ideal location is within a three-mile radius of urban areas, with high visibility. "We ideally look for spaces that are 2,000 to 2,600 square feet at end caps," says Chissler. "Our capacity standards hover around 80 seats with a large patio section. Another factor we look for is walkable or easy access to public transportation, which might include bikes, scooters and trains." 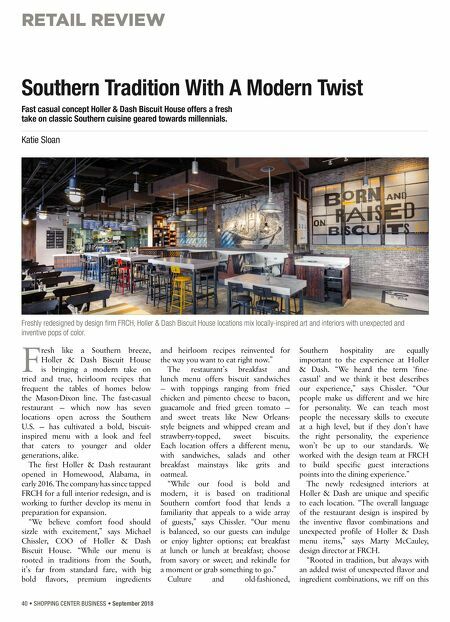 With plans to expand in the near future, Holler & Dash is continuing to develop its menu and is working to strengthen all systems within the organization in preparation for steady growth. SCB With seven locations currently open throughout the South, Holler & Dash Biscuit House is working to further develop its menu in preparation for expansion.